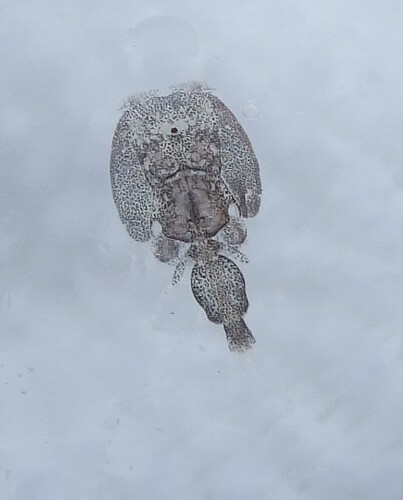 Sea lice are small parasitic crustaceans (like crabs and shrimp) that feed on the skin and mucous of fish. Lice normally do not harm adult salmon; however, small numbers may harm or kill juvenile salmon. Although sea lice occur naturally in the Northern Hemisphere, louse infestations have only recently been documented on wild juvenile salmon. Recent research shows wild salmon populations are at risk from sea lice arising from farms. Stocking hundreds of thousands of fish in small pens makes fish farms ideal breeding grounds for parasites such as sea lice, and drastically increases the number of lice in surrounding waters. Salmon farms are typically located in sheltered bays and inlets near rivers usually on or near the migratory routes juvenile salmon use to reach the open ocean. Salmon farms create an unnatural reservoir of sea lice that is especially detrimental to juvenile salmon because of their small size. One or two sea lice may be enough to kill a juvenile salmon. Much higher numbers have been observed recently on juvenile pink salmon near farms in BC. A collapse of pink salmon in the Broughton Archipelago in 2002 is likely related to sea lice from salmon farms. From an expected 3.6 million salmon, only 147,000 spawning fish returned. Watershed Watch produced the animated film Wild Salmon in Trouble to help explain how salmon farms affect the number of sea lice in coastal waters and how that impacts juvenile salmon. We also worked with film maker Damien Gillis to produce the film Aquacultural Revolution that interviews many prominent scientists and First Nation representatives who speak their minds about the salmon farming industry and the numerous problems associated with it. Salmon farmers monitor and treat farmed salmon for sea lice with pesticides that lower lice levels; however, these pesticides can kill other crustaceans, not just sea lice. It is unknown what negative effects these pesticides have on other organisms in the surrounding area such as crabs and shrimp. Even if average sea lice levels are kept “low” on a farm, even very low numbers of lice per farmed salmon can add up to billions of sea lice eggs being released into surrounding waters. Sea Louse Infection of Juvenile Sockeye Salmon in Relation to Marine Salmon Farms on Canada’s West Coast, is one of the first studies to demonstrate a potential role of salmon farms in sea lice transmission to juvenile sockeye salmon during their critical early marine migration. Moreover, it demonstrates a major migration corridor past farms for sockeye that originated in the Fraser River, a complex of populations that are the subject of conservation concern. The problems associated with sea lice from salmon farms are not limited to British Columbia. Major infestations of sea lice, both on wild and farmed salmon, have been reported everywhere salmon farms have been established.